It’s hard to believe, but Thanksgiving is this Thursday! This year has absolutely flown by for the Frugal Rules family. I don’t know about you, but it can be a challenge during the busiest times to sit back and reflect on what is going on in your life. This has always been a struggle of mine. I get wrapped up in the moment, what I have to get done and give little regard to what has happened. As Mrs. Frugal Rules would say, it’s my “task mode.” Long story short, it can be difficult to be thankful during those times because you feel like you’re on an unending treadmill and you won’t let yourself get off. We focus on that feeling or that moment and think we have little to nothing to be thankful for. Even in the worst of times, I refuse to believe that to be true. I know it’s cliché. It’s Thanksgiving and we’re “supposed” to be thankful. Don’t just go through the motions. Rather, take time to sit back and reflect. Reflect over what has happened over the course of the past week, month and year to look over what you’ve accomplished, what you’ve struggled with and where you’re going. If you’re like me, it can be a struggle to do this when there are distractions that can garner attention. I have to choose to turn those off to truly reflect on things. 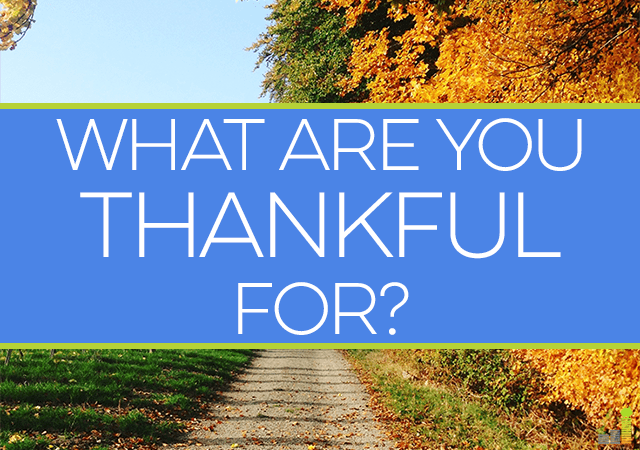 Studies show a thankful attitude can be good for your physical and mental health. I also believe such a practice can help you be true with yourself so you can identify where you want to be in life. Thankful for the kiddos! We often feel like we are messing them up, but every once in a while we look at them and think-hey, they’re actually turning out all right. I am thankful for a beautiful wife and daughter. I am especially thankful that my wife and I put ourselves in a position financially that she was able to resign from her job to stay home and raise the little one full-time. Happy Thanksgiving to you and your family John! To you as well Thias! Thankful for the hubby and Little Bit. Thankful for a healthy body and mind. Thankful for living in a beautiful, safe, secure country with plenty of economic, political and social freedoms. I’m thankful for for my beautiful wife and three great children! Love watching them grow into young adults. I’m very thankful for mine as well Brian, they’re definitely a gift to me! I’m thankful I quit practicing law, ended a relationship, started a new career, started a business, and moved to a new city. That’s what happened in 2015 for me and I’m so thankful for each of these choices! My list is similar to yours. I’m thankful for my country, my family, and our health! Those are great things to be thankful for Holly! I’m thankful for my husband & two kids (happy 2nd birthday to my girl today! ), many good friends, a relationship with God, having all our needs met, and for everyone who encouraged me to start blogging a year ago. It’s been super fun! Happy birthday to your daughter Kalie – that’s a fun age. Thanks Laurie – could not agree more! We have lots to be thankful for. Always good to pause in life and think about all the things we DO have versus what we want in life or don’t currently have. I’m very thankful for good health, friends, family, and opportunity. Completely agreed Tonya. Focusing on what we do have is a great exercise to go through. I am thankful for my bride of 38 years who embraced frugal living with me so we could retire early. I am thankful for my children and now also my grandchildren. I am thankful that my kids are all doing well financially and in their personal lives. 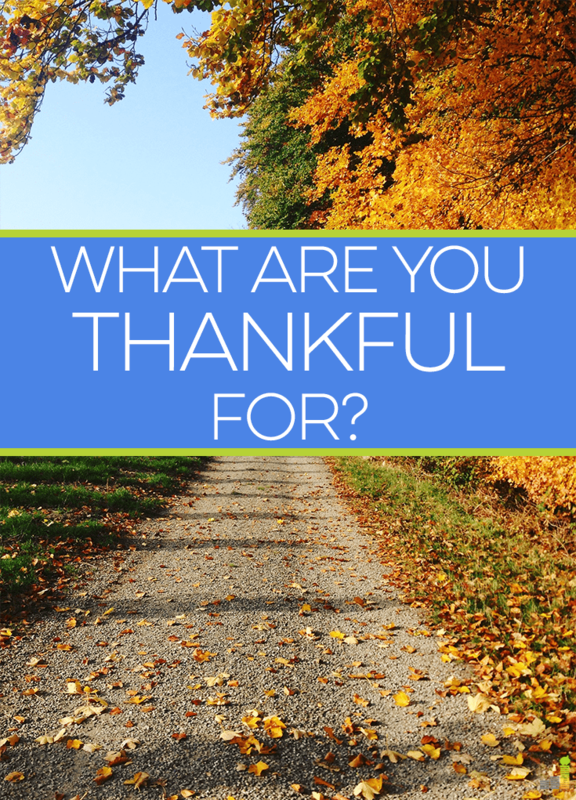 I am thankful for your post for giving me pause this morning and taking the time to reflect on what I am thankful for. Congrats on the 38 years Tommy – that’s awesome! Gratitude is key. We’re thankful to both be gainfully employed during this oil bust in Houston and to have our health, friends and family. Agreed Adam, gratitude is key. There are so many in this world who have little that we really should be grateful for what we do have. I’m thankful for my new job. I was looking to move up and still can’t believe how well it worked out. I am thankful for many of the same things as you John, family, career, savings, etc. but more recently I am thankful for the reminders that life is short and precious and we need to live each day to the fullest. It’s easy to get caught up into the grind and think everything is important but when you see how quickly your world can change, it gives you a much needed dose of perspective and I am thankful for that perspective. I could not agree more Shannon. We never know what might be around the corner – living life to the fullest and reflecting regularly are key ways to live in light of that. I am thankful for my family, first and foremost. They are my biggest cheerleaders as I am theirs. I am grateful for a long holiday weekend where I get to spend time with loved ones too. Happy Thanksgiving, John! Sounds like you have a fun weekend in store Shannon – have a Happy Thanksgiving! I’m very thankful for my family and all the fun things we’ve been able to do this year. I’m thankful for having a good income and work flexibility that allows us to do the things we do. Gotta love that flexibility Kim – I’m thankful for that in our lives as well. I’m thankful for my family and friends. I’m also thankful for the growth of my side hustles. Just recently, I have been VERY thankful for health insurance. It turned what could have been a costly, 2-night hospital stay into a very affordable $1700 (which also makes me thankful for a healthy emergency fund). All is well now–no long term effects. And that makes me thankful for my health! Yay! Happy Thanksgiving to all!